The Centre for Southeast European Studies (CSEES)was set up in November 2008 following the establishment of Southeastern Europe as a strategic priority at the University of Graz in 2000. The Centre is an interdisciplinary and cross-faculty institution for research and education, established with the goal to provide space for the rich teaching and research activities at the university on and with Southeastern Europe and to promote interdisciplinary collaboration. CSEES is publishing a peer-reviewed open access online journal "Contemporary Southeastern Europe" and a book series "Southeast European Studies" with Routledge. It also runs a Visiting Fellow program that has included over 60 fellows to date. The policy and research blogs also encourages its researchers to contribute to public outreach activities regularly. The Centre is organizing regular lectures, workshops, conferences, discussions and other events on current topics, including the brownbag seminars series and regular public events. The Centre has a large network of academic collaboration including universities, research institutions and civil society in Europe, in the Western Balkans and in Turkey and has led or participated in a various international research projects funded by Austrian Science Fund (FWF), European Commission, Zukunftsfond of the Republic of Austria, Akademie der Wissenschaften and Swiss Agency for Development and Cooperation related to democracy, minority rights and EU integration of Southeast Europe. 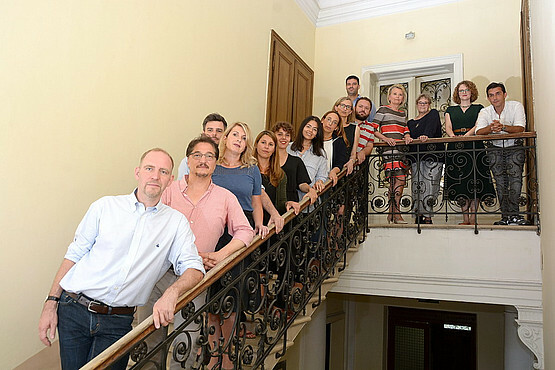 Additionally, the Centre is coordinating the Balkans in Europe Policy Advisory Group (BiEPAG), an open group of policy analysts, scholars and researchers. Early on, the Centre established close links with a number of West European Universities and partners in Southeastern Europe, such as LSE, Universities of Frankfurt and Cologne, and Universities of Sarajevo and Prishtina. Through the EU Framework Program 6 on “Human and Minority Rights in the Life-Cycle of Ethnic Conflicts” (MIRICO), the centre collaborated with the Centre for Human Rights in Belgrade. The centre successfully concluded a joint project Minorities in Central Europe (MIMI) in 2010 with partners from Slovakia, Hungary, Slovenia, and Italy, w funded by the Zukunftsfonds of Austria. In addition, the Centre conducted Tempus programs with the Universities of Skopje and Prishtina. In addition to regular teaching, the Centre also coordinates a Joint Master in South East European Studies (with the University of Belgrade and partners throughout Europe). Since 2010 the Centre manages “Balkan Academic News“, a mailing list with over 8000 subscribers. It was founded in 1999 by Florian Bieber as a network for academic information on Southeastern Europe. In October 2011, Florian Bieber took over as the director of the Centre from the founder Joseph Marko. An interdisciplinary team of lawyers, historians, and political scientists has contributed through numerous articles, monographs and other publications to research on Southeastern Europe. In addition, the centre is regularly organizing international conferences and workshops to promote cutting edge research on Southeastern Europe.